You may recall the pierogis TWSF made for the Daring Cooks August challenge. We like to be well-rounded, and decided to join the Daring Bakers as well. 1. You must make the Basic Sugar Cookie recipe provided. 2. You must make your cookies with the theme of September, whatever that means to you. To me, September means foliage and apples. Growing up in New England, I was spoiled with the best foliage around. If you take a drive up through the mountains of New Hampshire in late September, the roads will be lined with trees full of red and orange leaves. My family and friends went apple picking every September as well, my favorite parts being the hayrides and of course, cider donuts. These cookies were pretty easy to make, and would be perfect to bring to holiday/themed parties, or to give out as party favors and gifts. 1. Cream together the butter, sugar, and vanilla extract. 2. Beat in the egg until well combined, make sure to scrape down the sides of the bowl. 3. Add the sifted flour and mix on low until a non sticky dough forms. 4. Knead into a ball and divide into 2 or 3 pieces. 5. Roll out each portion between parchment paper to a thickness of about 1/4 inch. By rolling the dough between parchment, this shortens the chilling time and then it’s also been rolled out while still soft making it easier and quicker. 6. Refrigerate for a minimum of 30mins. 7. Once chilled, peel off top parchment. 8. Cut out shapes with cookie cutters or a sharp knife. 9. Arrange shapes on parchment lined baking sheets and refrigerate for another 30 minutes to an hour. 10. Re-roll scraps and follow the above process until all scraps are used up. 11. Preheat oven to 350°F. 12. Bake until golden around the edges, about 8-15mins depending on the size of the cookies (mine took exactly 10 minutes). 13. Leave to cool on cooling racks. 14. Once completely cooled, decorate as desired. 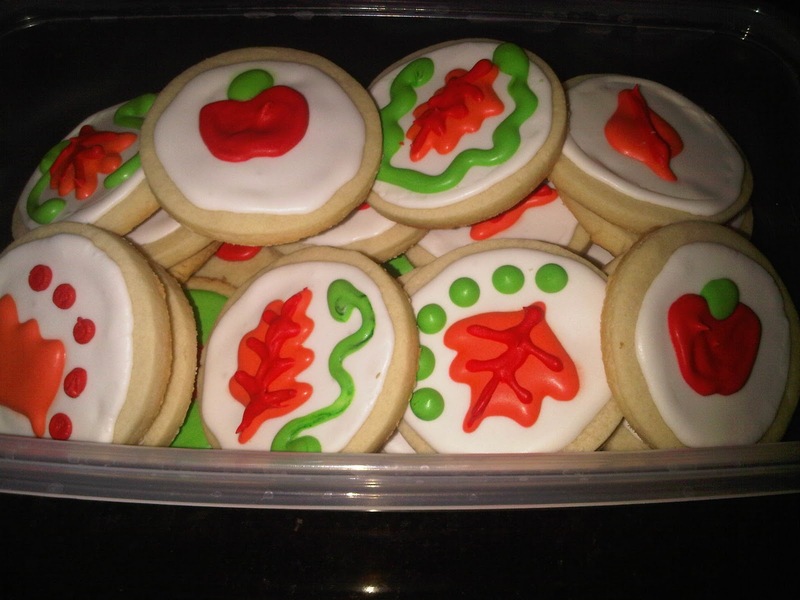 If kept in airtight containers in a cool place, un-decorated cookies can last up to a month. 1. Beat egg whites with lemon juice until combined. 2. Sift the powdered sugar to remove lumps and add it to the egg whites. ** 2 1/2 cups is good for a flooding consistency, and 3 cups is good for outlining. If you need to make icing thinner, add water, drops at a time until you reach the desired consistency. 3. Beat on low until combined and smooth. 4. Use immediately or keep in an airtight container. Royal Icing starts to harden as soon as it’s in contact with air, cover containers with plastic wrap while not in use. Now for the decorating. You'll need piping bags and a cake decorating tip. You can find these in most grocery stores and craft stores. To create base frosting (below) I first outlined a circle on the top of the cookie. The circle serves as a "wall," so that when you fill in the rest of the center with icing it doesn't fall over the edge. After creating your "wall," go ahead and flood the circle with icing. The easiest way to flood is to zig-zag your icing in the circle, and use a toothpick to push the icing into the wall. If you are using a different color for the wall, let it dry before you flood it with another color. Once your first layer is dry, go ahead and decorate the cookie however you like. I used gel-based colors in the same icing I used for the first layer to get vibrant red, orange, and green colors. I don't recommend using your typical food coloring, you can buy these gel-based colorings at craft stores. Again, use a piping bag and decorating tip to create the cookie of your dreams! chuck raved about these cookies yesterday. this and a lobster truck? i need to catch up on all the recipes!